Molly [Mary Ann] Dyer [1839-1926], married Charles Goodnight in 1870 in Hickman Kentucky. They almost immediately traveled to St. Louis and then by train to Abilene, Kansas before setting out on a 400 miie trek to Goodnight’s ranch in Pueblo, Colorado. Her life with Goodnight must have been trying. When they moved to the Palo Duro, she was one of only two women within hundreds of miles. 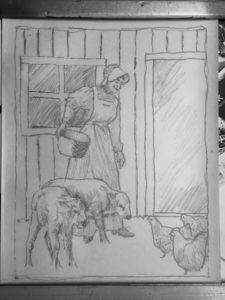 A cowboy gave her three chickens, which became her companions. Molly’s distress at the slaughter of the buffalo was one reason Goodnight began capturing the animals, and she was key in many of his endeavors to improve life in the panhandle. 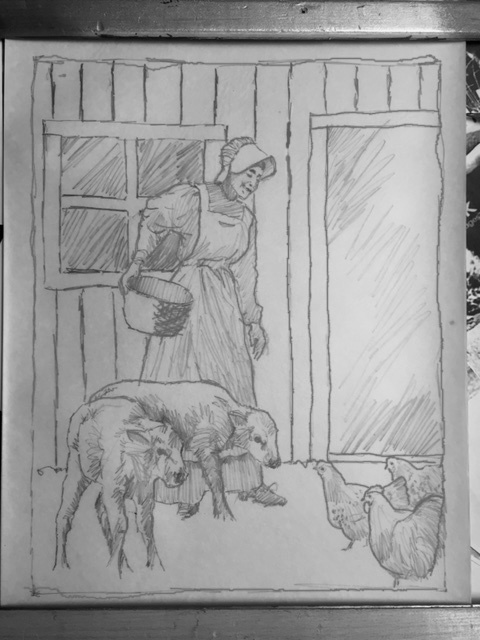 Molly was doctor, nurse, homemaker, spiritual comforter, sister, and mother to the hands working on the ranch. Charles grieved deeply after her passing. The cabin was flopped and reduced in size to open more space. The construction of the cabin was changed to be more in line with the possible construction of cabins at that time in history. The window was placed behind Molly’s head to draw more attention to her. 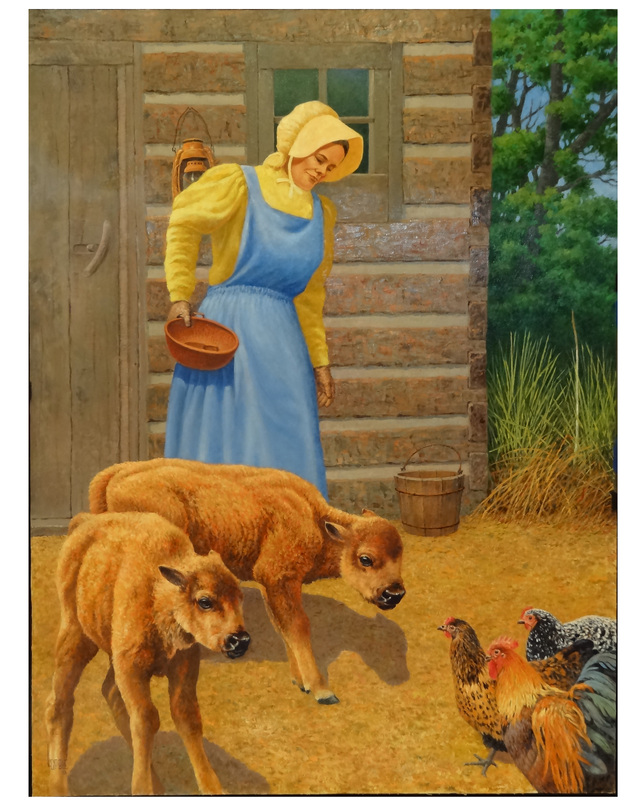 The calves and chickens were enlarged and repositioned to draw the viewer into the composition. Molly was an integral part of Goodnight’s story and the history of Texas. I felt she deserved an image befitting a lady of compassion and frontier courage.